Count Dooku (also known as Darth Tyranus) became known to us as the plot of Episode II - Attack of the Clones unfolded. Dooku, the Padawan of Yoda, was an extremely outspoken Jedi who regularly disagreed with the Jedi council. In turn Dookus Padawan, Qui-Gonn Jinn also proved himself to a be quite stubborn and not always ready to accept the decisions of the Jedi council. The frustration with loftier Jedi ideals led Dooku to renounce his commission as Jedi knight. Appearing as a charismatic separatist to outsiders while he continually incited rebellion and violence agains the Republic through his agents at every opportunity. Dooku kept his separate agenda a secret until the last possible moment. Only for the intervention of a Jedi and Clone Army task force all would have been lost on Geonosis. A master of Form II lightsaber combat Dooku set himself apart by using a very individual lightsaber which sported a curved handle- distinctive amongst all the single bladed lightsabers you'd come to know so far. It almost "felt" like Dooku was using the lightsaber version of a scimitar or rapier.The styling of his weapon matched his fighting style which focuses on more precision and less movement. 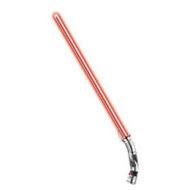 His lightsaber both looked menacing and proved to be extremely dangerous in combat with Count Dooku displaying almost unlimited power and skill. Both Obi Wan Kenobi and Anakin Skywalker were both seriously wounded when they confronted Dooku on Geonosis - Anakin losing his right arm to Dookus lightsaber. The appearance of Yoda, Dookus former Jedi master, put the Sith Lord to flight after a brief duel with the diminutive Jedi Master. Dooku made a final appearance in Episode III - Revenge of The Sith. Coincidentally the name Tyranus means Tyrant in latin. Want your own Count Dooku Force FX lightsaber?